The Marquette Crew team hosted their first ever Spring Duel Match on the Milwaukee River today. 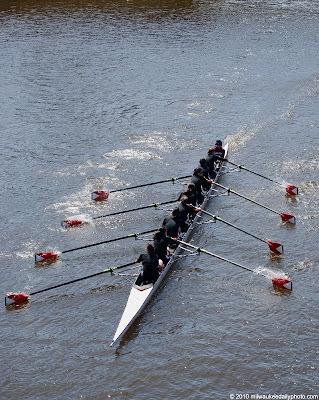 Teams from Lawrence University and the University of Chicago came to town to compete in races of Men's 4's and 8's, Women's 4's and 8's, and Mixed 8's. Today's photo is of the U of C Women's 8 team, moving up river near the Knapp Street Bridge. I guess they rowed under a bridge upon which you were standing? Good timing!